William Cleary was walking his dog on his residential Eggertsville block when he smelled fire. Down the street, he found neighbor Douglas Levere in his snowy yard, huddled over a tabletop metal box emitting billows of smoke. “I’m making pizza,” Levere explained. Then Cleary saw Levere’s finished pizzas on Facebook, puffy-edged, and judiciously singed in the Neapolitan style. He came back, and cooked in the snow. Then Cleary bought his own box. 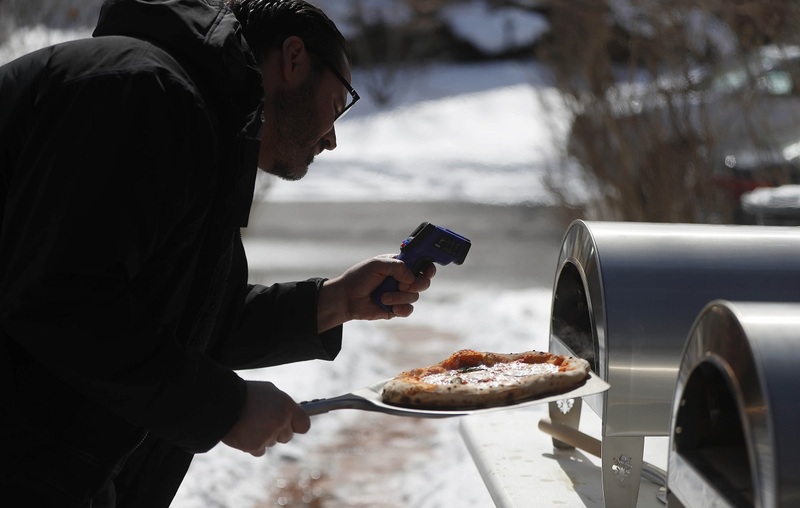 Getting bitten by the backyard pizza bug used to mean expensive masonry ovens, limiting its spread. 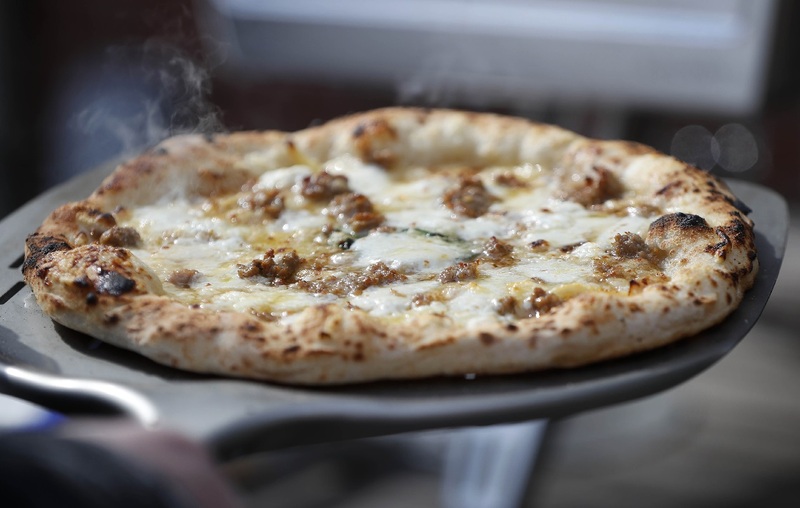 Now that a new generation of tabletop ovens has put worthwhile Neapolitan-inspired pizza within reach of avid eaters for the price of a nice gas grill, it’s reaching epidemic stage. On a recent afternoon, Levere and Cleary tested the Roccbox, Ooni Pro, Ardore basic, and Ardore with optional ceramic insert, to see which they liked best. “They can all make good pizza,” was the short answer. You don’t have to take a bunch of amateurs’ opinion for it. That’s according to Jay Langfelder, owner of Jay’s Artisan Pizza, 2872 Delaware Ave., who came over to help with the testing. “They’re all pretty good,” he said. Langfelder also wanted to satisfy his curiosity about how the tabletop units’ output compared to his 3,000-pound ceramic oven. 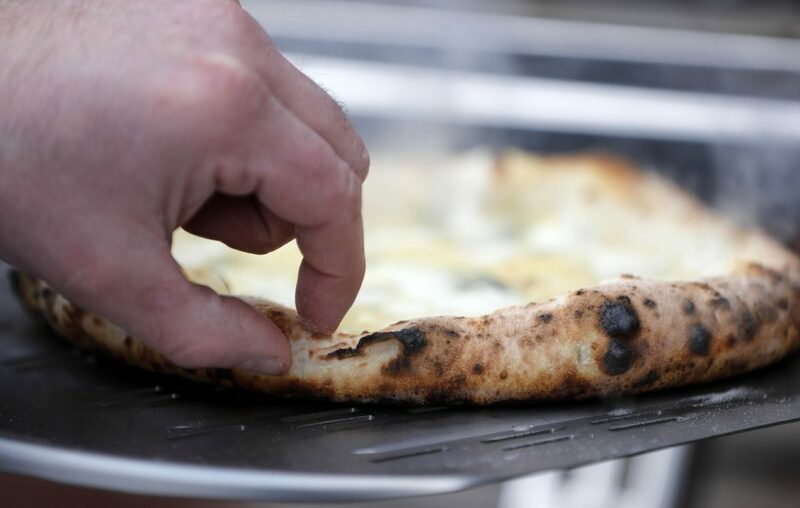 It takes seven hours to heat that mass of masonry to proper pizza temperatures, around 900 degrees. Whole Foods sells a dough that can be used for Neapolitan-style pizzas. A Wegmans dough charred too fast at Neapolitan temperatures, though it would be fine if cooked at the usual household 500-degree range. These pizzamakers make their own dough, using only flour, water, salt, and yeast or natural starter. Langfelder prefers yeast doughs for pizza, for the structure and texture it provides. 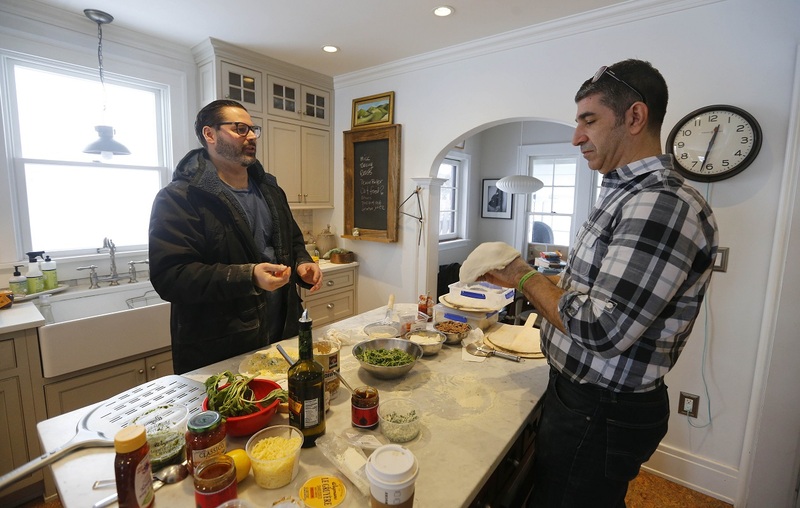 “I can make my dough in about 20 minutes now, pack it up and put it in the refrigerator for a couple days,” Cleary said. When he gets home from work, he can turn on his oven and have pizza in 30 minutes. That’s faster than delivery. 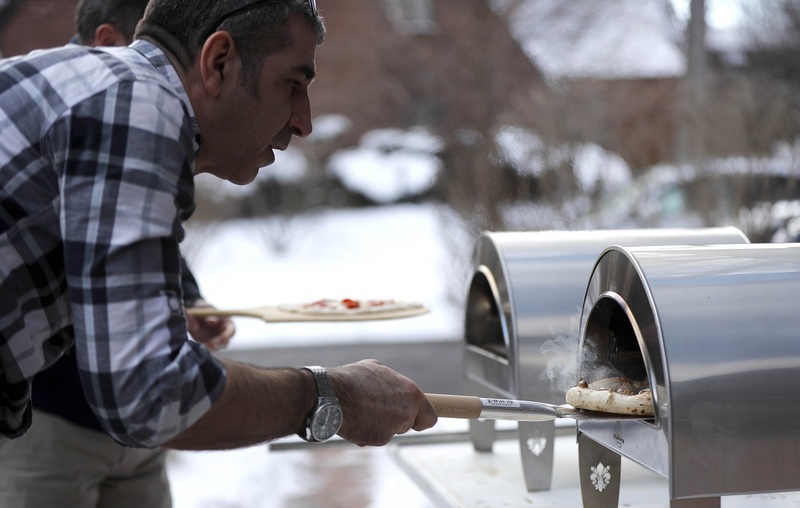 Neapolitan-style pizza is fast food, cooking in seconds as the pizzamaker rotates it for even cooking. Once the doughs were stretched out and topped lightly with sauces, cheeses, and more, the cooks confirmed the proper temperatures with infrared thermometers and shook the slabs off peels into preheated ovens. The wood-pellet-fired models turned out to be too much hassle once propane-fired models became available, so now they’re cooking with gas. Deftly turning the pizzas for an even cook that leaves the pizza properly puffy-edged and slightly singed requires experience, they warned. Expect to ruin a batch, watch some more cooking videos, and ruin another batch slightly less abjectly. After the cooking was done, the backyard pizzamakers offered some verdicts. The Ardore model outfitted with biscotto tile insert ($660, ships from Italian manufacturer) was the winner, by a nose. While all four ovens are capable of memorable pizza, they said, the details resulted in them giving the Ardore-plus-tiles the nod. 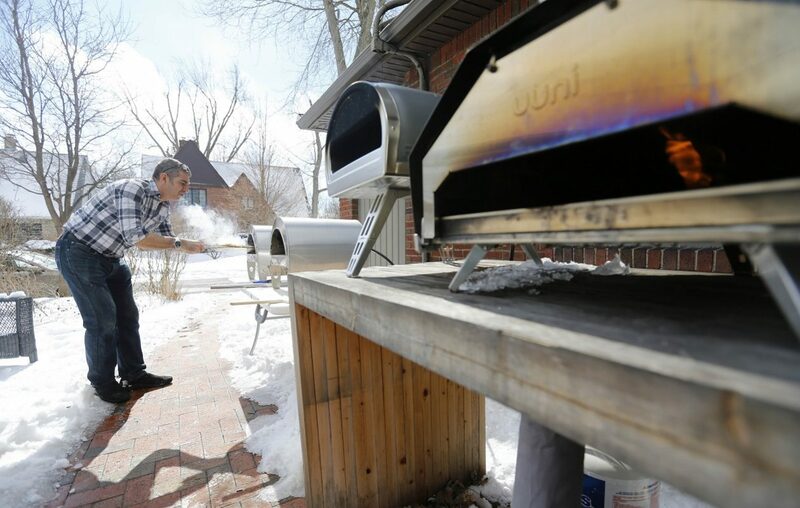 “It’s more enjoyable than the Ooni because you can watch it cook, you don’t have to leave the door on,” Levere said. In his experienced hands, at least, it produced more consistent results. “The Ardore has a more even heat source, so you don’t have to turn it as often, whereas the Ooni has a tight heat source in the back, so you have to turn in to keep it from burning,” Levere said. Outfitted with the ceramic tiles, the oven held its temperature better, so cooks didn’t have to wait as long for the temperature to rise back into the target zone. Compared to the Roccbox and Ooni, the higher-ceilinged Ardore was also slightly easier to work inside, the cooks said, rotating the pizzas in a timely fashion as they rose and bubbled. Langfelder said he liked the Ardore, then the Roccbox. “It was close,” he allowed. There is a learning curve, to be sure, but it pays off, Levere said. “Getting it in October or November a few years ago, and doing my first cooks outside in cold weather, that was not a fun beginning,” he said.